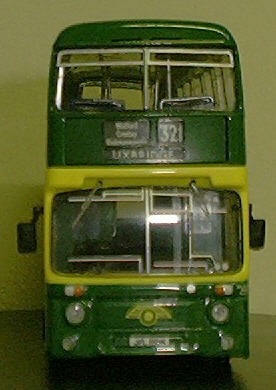 Well folks, I've just received my eagerly awaited Britbus Atlanteans. 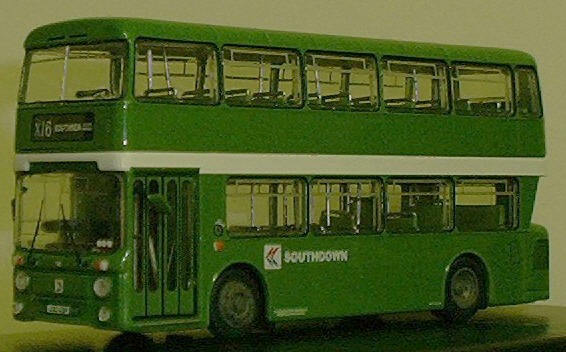 They're lovely models and have reproduced the curves of Park Royal Atlanteans really well. 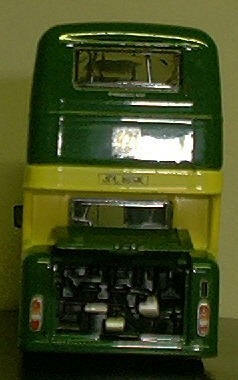 The engine bonnet cover also opens! The point of this page - some things aren't quite right, so thought as part owner of a full size one it is only right to put these on record, where possible using pictures of AN121 to illustrate. Apologies for the quality of some of the pictures below. My camera doesn't like close ups! 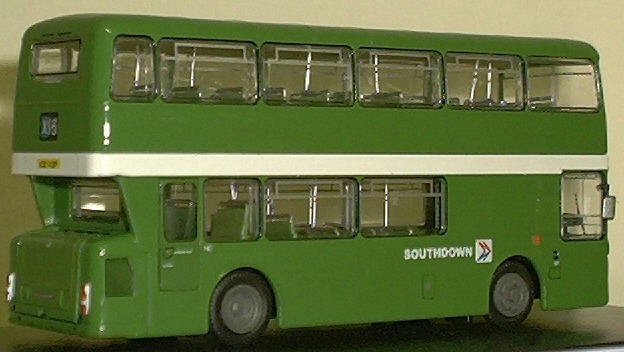 To be honest, I purchased this model with the intention of removing the SOUTHDOWN logo and fleetnames and creating LCBS SV AN131, 132, 158 or 179! However, the staircase runs the opposite way (like some VRs), so was not the best idea I've had! 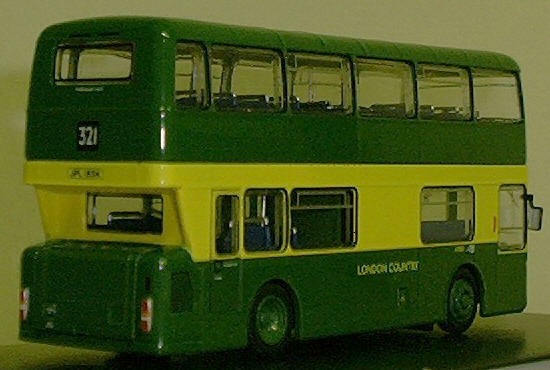 I can only find a picture of 715 (PUF715M), which shows the staircase running the same way as London Country's Atlanteans, but it is possible that 743 (LCD 43P) is different. This is a "genuine" AN68 chassis model, but the WHITE band isn't wide enough. It should have the same gap which the LCBS model has from the yellow to the bottom of the ultimate destination. Seems a shame that with AN121 attending rallies (and the photos on this site) this basic difference between LCBS's AN1 - 90 has not been reproduced. 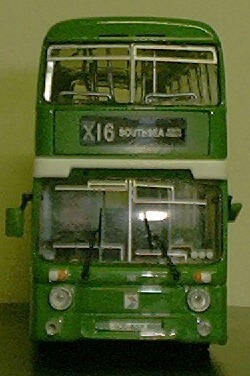 See following picture of AN121 illustrating this. The glass in the lower deck emergency door appears to be slightly too big and the glass in the upper deck emergency exit should be lower down. The only other let down is the beading running across the roof, as on AN68 models, this is visible on the nearside but actually stops about 6 inches from the roof's edge (except for the front and rear dome). AN1 - 90 being PDR1A/1 specials, do run right across the roof. The rear lights should have indicator (orange) at top then side/brake light (red) - however easy to change with a steady hand and a splodge of paint! The entrance doors could have shown the slightly wider edge panels - but the height where the glass starts looks correct. 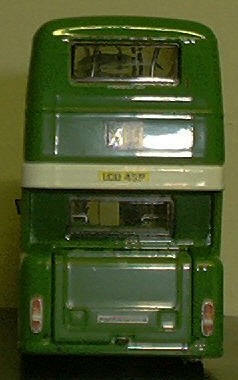 AN121's doors are different before you try to compare! Lovely to see the green and yellow, which I remember seeing for the last time on SV's AN70! The biggest let down on this model is the downstairs seating arrangement which sees a seat for 2 instead of 3 across the rear wheelarches. The gap from the back door to the first nearside seat should have given this away and is reproduced nicely on the various LT DM/DMS models. The front and rear doors show centre poles like AN121, but of course AN1 - 90 had the nice wide unobstructed entrance and exit! I also don't remember there being any upstairs poles/stanchions other than the two at the top of the stairs on AN1 - 90. The panel at the bottom of the stairs on my model should not obstruct the window, thus allowing daylight into it! 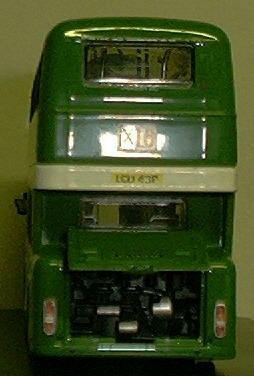 The width of the band painted WHITE when the NBC livery came along seems fine (unlike the SOUTHDOWN model). The rear lights should have indicator (orange) at top then side/brake light - however easy to change with a steady hand and a splodge of paint! The entrance and exit doors could have shown the slightly wider edge panels - but the height where the glass starts looks correct. AN121's doors are different before you try to compare! The isn't an emergency door control for the rear door. Having listed the things I see that aren't quite right, they are lovely models and are worth buying for the front view which I honestly never thought I would see being reproduced as well. The destination blinds look realistic on both models with the "behind glass" look. I'd have preferred transfers (like the rear), but some advertisements on the front will hide the gaps, which does slightly spoil the otherwise stunning frontal appearance?! LONDON COUNTRY Atlanteans currently available (25th February 2007) from http://www.combemartinmodels.com for £31.95 including P & P.
Not sure where else you can obtain the LCBS models from now, as everywhere on the web I've tried (2nd February 2007) are now out of stock, however you can reserve the latest liveries from GoldStar. 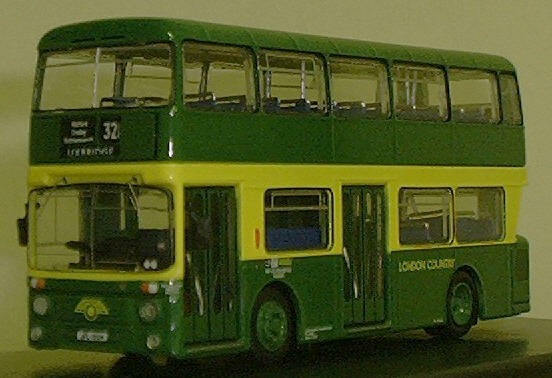 I just wish these models were around 30 years ago when the closest looking model available was the "Yellow Pages" and "Kenning Car Van & Truck Hire" Dinky Atlanteans!